Navy stormed out of the locker room, with their seniors looking determined not to be the class to give up Navy’s history winning streak in this series. After a 48-yard kickoff return to get Navy into great field position, future Navy SEAL Alexander Teich scored a touchdown to put Navy up by 7. The Black Knights will not go away, though. In one of the few passes attempted in the game, Army quarterback Trent Steelman connected with slotback Malcolm Brown on a 25-yard touchdown pass to tie the game. Both offenses have since been stifled, although the third quarter ended with Navy on a promising drive. 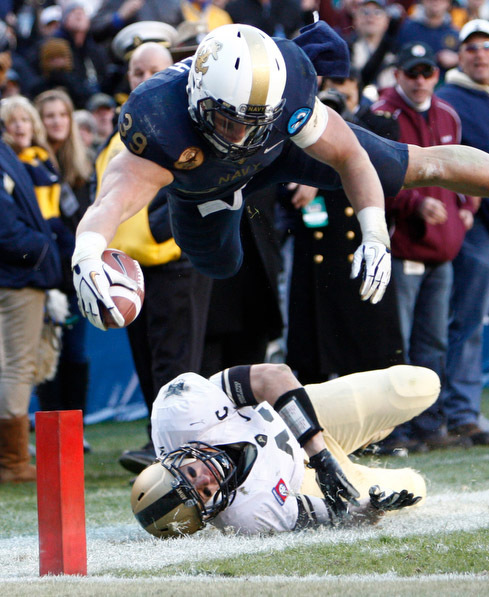 This game looks to come down to the last possession, and this must be the best Army-Navy game in the past decade. Army Coach Rich Ellerson has finally built Army’s football program up to be on equal footing with the Midshipmen. Today’s winner might be decided by who can protect the ball the best. Both teams have struggled to avoid fumbles as Navy and Army ball carriers have each lost two fumbles. Defenders are clearly looking to strip the ball on every carry. Penalties have also plagued the Black Knights. Two chop blocks have killed drives. Who can avoid the most mistakes in the fourth quarter will win 112th meeting.